Having lived on the northern beaches for nearly 65 years, Nadier Milham is a seasoned northern beaches local. 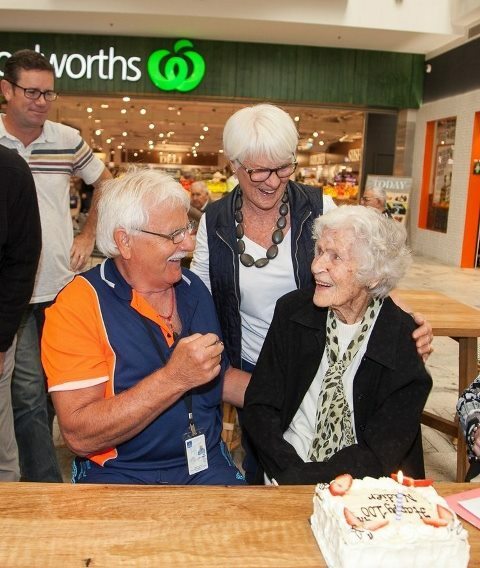 Nadier recently celebrated her 100th birthday, a great milestone which was matched by her triumph of living independently in her own home. Nadier has enjoyed being able to get out and about with Easylink, who have helped her continue do her own shopping on the fortnightly shopping bus service. “They are wonderful. The bus drives to my house and comes to my entrance to pick me up. The lovely driver and two ladies assisting are so helpful. When the shopping is done they help me bring my groceries to the door,” said Nadier. Volunteer bus driver, Tony, said that in the 5 years he has been driving, Nadier has only missed one shopping trip to date. The shopping trips have become more than a simple service, for Nadier they are a chance to get out of the house and catch up with friends. Alongside the support of her family, friends and strong community ties, Easylink has proven to be a saving grace for Nadier in maintaining her independence through the years. Ron’s visits to the doctor and hospital have increased as he approaches his mid-80s. Easylink’s services have provided him with the support he needs to attend his appointments and get about in his everyday life. For Ron, Easylink has gone above and beyond typical transport services, with the staff always providing caring, courteous and efficient service. Booked in for a series of tests at the Royal North Shore Hospital, Ron had arranged to travel home on the Easylink shuttle bus. Additional tests were necessary and despite racing on his walker from the hospital, Ron was running late for the scheduled shuttle. To his pleasant surprise, the Easylink driver was there waiting with a smile, she told Ron that he would not be left behind to find his own way home. With Easylink willing to wait beyond their allotted timetable for their passengers, Ron believes that this ‘uncommon practice’ is standard service when travelling with Easylink. After suffering a spinal injury, Margaret found herself limited physically. In her search for support, Margaret came across Easylink. She has now been travelling with Easylink for three years and is a regular on the social outings. A self-professed chatterbox, Margaret enjoys the great companionship she has found through Easylink. Picked up from her doorstep, she enjoys the chance to get out and visit new places. “It would kill me if this service stopped, it keeps me alive,” says Margaret. Your generous contributions make our work possible. Want to find out more about Easylink?